Do you ever struggle to trust in the Lord with all your heart? To turn everything over to Him, do things His way, and rest easy knowing that God has a plan and everything is going to be okay? But how do we DO that exactly?? After all, trusting in the Lord isn’t always easy, and while there are plenty of Bible verses that tell us that we’re supposed to trust God’s will, they aren’t always clear about how we’re supposed to do that, practically speaking. Well, the good news is – if you want to learn how to trust in the Lord with all your heart but you’re not sure where to start, you’re in luck. I’ve scoured the web to find some of the BEST books, verses, articles, sermons and more on trusting in the Lord – and today I’d like to share them with you! No matter what circumstances you find yourself facing today, I really hope these resources encourage, equip and inspire you to trust in the Lord today. *This post contains affiliate links, which means if you make a purchase, I may make a small commission at no additional cost to you. This helps cover the costs of running this site and allows me to help provide for my family. Thank you! If you’re going through a tough season right now and you want to stay strong in faith while you wait for your answer, I’d love for you to learn more here. Arabah Joy is an overseas missionary, a committed Christian and a good friend of mine. Her book, “Trust Without Borders” is half 40-day devotional, half memoir and completely inspiring. While you’re supposed to read it over the course of 40 days, I finished it in two. Her stories were so interesting and inspiring – I couldn’t put it down! In “Trusting God: Even When Life Hurts,” Bridges definitely dives deep into Scripture, all while presenting his well-researched findings in a way that’s still easy to understand and accept. If you’re looking for a meaty, Scripture-packed explanation for the struggles in life – this is it. Learn more here. I’ve been a huge fan of “The Case for Christ” for years now, and this book in the series does not disappoint. In “The Case for Faith,” atheistic reporter turned Christianity detective, Stroebel lays out a wealth of solid research and evidence for why we CAN trust in the Lord, completely overcoming Christianity’s toughest objections. If you’re feeling unsure or doubtful about this whole Jesus thing, this book is for you. Learn more here. 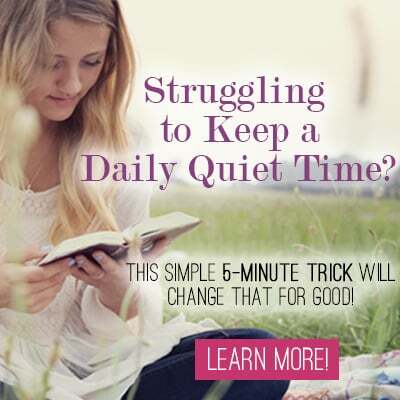 On the other hand, maybe you already know all the Scripture verses, Bible stories and “churchy” answers, and what you really need is just a little bit of encouragement in your day-to-day struggles. If that’s you, then “Trusting God Day by Day” may be a better fit. 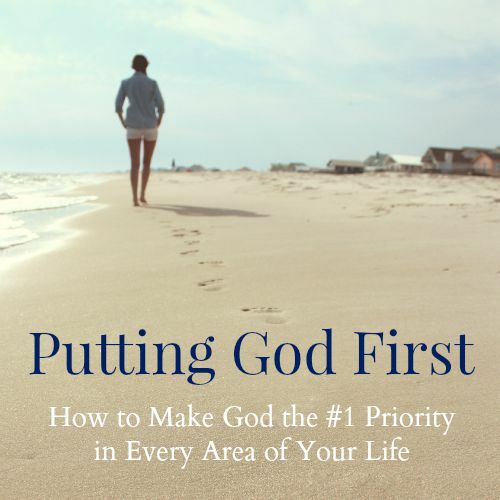 With 365 short and encouraging trust prompts, this Joyce Meyer devotional will help you start your days off on the right foot. Learn more here. 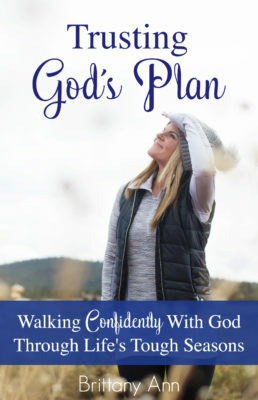 Do you ever struggle to trust God’s plan for your life? Especially when things get tough? If so, I have a free video series I created JUST for you that I’d love for you to check out! Four practical ways to make going through hard times much, much easier. Interested? I’d be happy to send them to you so you can check them out and see what you think. Just enter your email in the box below so I know where to send them, and I’ll get them sent right your way. 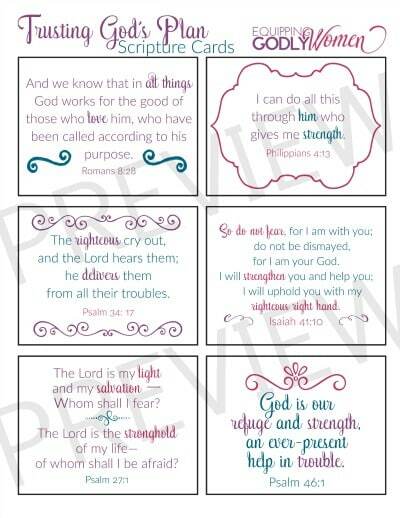 Or how about these beautiful “Trusting God’s Plan” printable Scripture verse cards? These are fantastic to print out and hold on to when you’re going through a tough season. You can put them on your mirror, on the fridge, in your purse, in your desk at work… Wherever you could use that extra reminder that God is with you, God has a plan for you and you are not alone! Here are some of my absolute favorite articles on trusting in the Lord — both mine and others. Definitely worth looking through to see if any catch your eye! Of course, sometimes we KNOW how to trust God; we just have to remember to actually DO it. And one of the best ways I’ve found to remember to trust God is to have some sort of physical reminder handy that you can see all the time. Alright, so there you have it! A massive collection of some of the very BEST resources out there to help you trust in the Lord! Hopefully you’ve found several things that will be helpful to you!! Any really good resources I forgot or don’t know about? What products, resources or tricks do you use to help you trust in the Lord more and more every day? Let me know in the comments below!